This is yet another quote from Jack Kornfield’s lovely little volume, Buddha’s Little Instruction Book (page 89). I like Jack’s little book, which is described as a “distillation” and “adaptation” of Buddhist teachings. Many of the sayings in the book seem to be of Jack’s own coinage, but this particular one can be traced back to a canonical source, albeit a Mahayana one. With a bit of detective work I managed to work out the “chain of custody” behind the words. 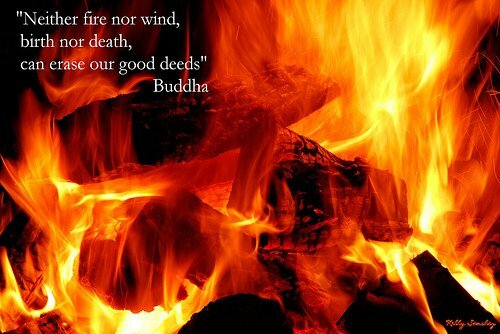 So “Neither fire nor wind, birth nor death can erase our good deeds” is from Buddha’s Little Instruction Book. This is turn is based on “Neither fire, nor moisture, nor wind can destroy the blessing of a good deed, and blessings benefit the whole world,” which is from the same author’s Teachings of the Buddha (1996), or at least both of these quotes are variants of each other. And this comes from some Sanskrit original, but sadly I don’t know what that is. The form of the dialog that takes place in the sutra, between a deva (deity) and the Buddha, is very similar to suttas in the Pali Samyutta Nikaya, where there’s one entire section of conversations with Devas, and another with “young devas.” But this exchange doesn’t seem to be present in the Samyutta. It may be present elsewhere in the Tipikata. The reference to fire, water, and wind is a nod to Buddhist cosmology and eschatology, where it’s said that the universe is ended by the actions of those three elements. Although the physical universe can be destroyed, the Buddha appears to be saying, the benefits of our actions will continue. If that sounds puzzling, it’s probably because the end of the universe, in the Buddha’s understanding, is not final. Just as human beings are said to die and be reborn, so too the universe goes through periods of evolution (creation) and involution (destruction). When the universe begins a new process of evolution, beings from the previous version of the universe are reborn there. This is discussed in the Pali Agañña Sutta. Although this sutta is generally held to be satirical, it probably does include something of the Buddha’s understanding of cosmology. What’s being discussed in this quote is the Buddhist teaching of karma (or kamma, in Pali). Karma simply means “action,” but it’s ethical or unethical action that we’re concerned about. What determines whether our actions are ethical or unethical is the intention (cetana) behind them. When the intention is unskillful (i.e. based on greed, hatred, and delusion) the action that arises is unskillful and leads to pain for ourselves and others). When our intention is skillful, the resulting action is skillful, and the results are a reduction in pain for ourselves and others. The Buddha argued against the idea that externalities (purification rituals, prayer, etc.) could affect the course of this dynamic. He said that praying for the good rebirth of someone who has acted unskillfully was as useless as praying that a rock would fall upward. though many people are bathing here. “Not by birth is one an outcast; not by birth is one a brahman. By deed one becomes an outcast, by deed one becomes a brahman. So the quote, although a little opaque, does embody a genuine Buddhist teaching, and it also comes from the (Mahayana) scriptures. The wording is a little condensed and compressed, and the mention of “birth and death” isn’t in the Chinese version, so I’m classifying this as “fakeish” rather than fake or genuine.